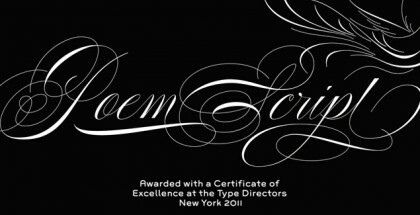 Ganache font is the new champion by Laura Worthington (read Fontmatter’s interview with her). Focused on package and logo design it has delicious, round and bouncing look, flavored with a lot of charm that could easily change the taste of your chocolate from bitter to sweet. Ganache is charged with warmth, happiness, music and emotions inheriting the tradition of previous fonts by Laura like Number Five, Al Fresco, Hummingbird, Alana Pro. Letters are fitting perfectly without any need to create physical connections between them – they look like having their own dance and rhythm, accompanied by excellent legibility and contrast even at small sizes. 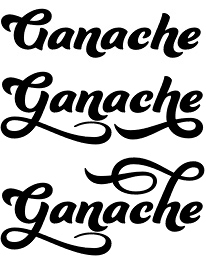 Ganache font has an impressive set of 185 swashes and alternates plus 10 ornaments – combined with large multilingual support every designer will have all the freedom to personalize almost every single glyph in opentype-aware software. Ganache has joyful yet strong presence and would surely be preferred by every designer who wants to have bespoke logo, outstanding packaging, custom t-shirt or even extraordinary typographic poster – Ganache will do all these for you with single click of the mouse. Enjoy it but be careful and pay enough attention to everything you do because this typeface is a masterpiece and deserves only the highest quality around.